VietNamNet Bridge – Minister of Culture, Sports and Tourism Nguyen Ngoc Thien talks to Vietnam News Agency about the country’s 2018 performance and plans for the new year. 2018 was a successful year for Vietnam’s tourism industry with 15.5 million foreign arrivals, 80 million domestic tourist trips and total revenue of VND620 trillion (US$26.6 billion). What do you think the main factors were behind this success? The tourism sector enjoyed favourable conditions in 2081. Legislation and policies regarding the management and development of tourism have taken shape, and the impetus for growth from tourism investors and businesses remains strong. Vietnam continues to push for deeper regional and international integration, capitalising on its strategic position in a highly dynamic Asia-Pacific. The new, appealing face of Vietnam’s tourism sector has been widely broadcast to global audiences. Our many attractions have been recognised and received international awards. Last year’s three figures – the number of foreign arrivals, domestic trips and revenue from tourism – all surpassed their targets. Continuing on a strong growth path laid in 2016 and 2017, last year, VIetnam recorded 19.9 per cent growth in foreign arrivals. To meet the 18 million target in 2019, the Vietnamese tourism industry will need to carry out several measures. We need to boost our image and step up promotion campaigns in valuable markets such as the East Asian region (China, Taiwan, South Korea, Japan) as well as nearby potential markets including those within Southeast Asia such as Thailand, Malaysia and Indonesia. In this regard, the tourism industry will also need to pay greater attention to e-marketing and other online tourism promotion channels such as websites and social media, with a focus on mobile devices. A project entitled “Enhancing the Effectiveness of Tourism Promotion Activities” is being carried out by the Ministry of Culture, Sports and Tourism, with priorities set on introducing changes to and expanding the scope of the sector’s tourism promotion efforts both within and outside the country, while taking advantage of IT to promote the country’s images to the rest of the world. Vietnam will also be more active in its participation in international large-scale events such as the Olympics, tourism fairs, festivals and economic forums. 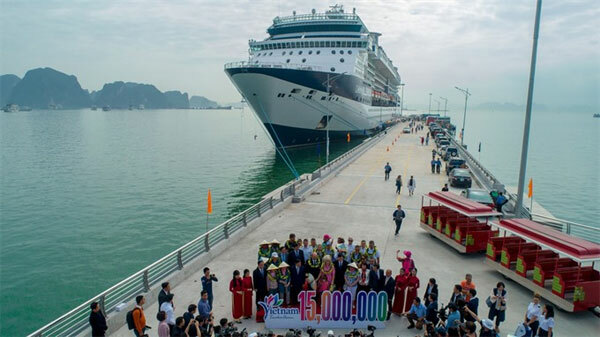 The tourism industry will intensify co-operation with overseas agencies to hold events and revamp the presentation of Vietnamese tourism products to attract a wider audience with clear, eye-catching themes and messages that will be well-received by potential tourists. Tourism is a multidimensional and integrated industry, so the ministry needs to strengthen its collaboration with other agencies and sectors and increase the involvement of the private sector and society in tourism promotions. Local tourism authorities need to maintain strong control over service quality and take action to deal with low-quality service providers and ensure security and safety at popular destinations. 2018 was also a great year for sport in the country, including the honours and titles the national football teams won at regional competitions. How do you think Vietnamese football will fare in the years to come? In recent times, we have all witnessed the impressive growth and great performances by our football teams in various age groups at regional and continental tournaments. In 2019 and the years to come, I hope Vietnamese football – from youth team clubs to the national teams – will continue to rise on a regional and continental level with a vision to turning the country into one of the football centres of the region and Asia. We are working towards securing a place for Vietnam in Asia’s top 10 best football nations, making football an effective tool to educate lessons of patriotism, national pride and to promote the image of Vietnam to the world. Is there enough investment in sport? In recent years, the budget has been limited, so we only focused on certain priority sports that are part of the Asian Games (ASIAD) and the Olympics that are suitable to Vietnamese athletes, and this has proved a successful strategy. In 2016, Vietnam for the first time earned a gold and a silver medal at the Olympics and one gold, one silver and two bronzes at the Paralympic Games in Rio, Brazil. At ASIAD 2018 in Indonesia, the Vietnamese delegation was placed 17 out of 45 participating countries and territories, winning a total of 38 medals, including first-ever golds in essential Olympic sports like rowing and track-and-field. What are your expectations for the development of the country’s culture, sports and tourism? 2019 marks the final year of the “Strategy to Develop Viet Nam’s Culture Towards 2020” approved by the Government in 2009. The Ministry of Culture, Sports and Tourism will work with other ministries, agencies and local authorities to review the implementation of the strategy and lay out the next steps. I hope for more positive impacts from policies, campaigns and activities targeting the improvements of social morals. We have been carrying out several ‘good person, good deed’ programmes and offered better support for artists and craftsmen, as well as measures to rectify cultural activities in the country. We expect these efforts to pay off. Vietnam sports, I hope, will continue to deliver a good performance following the achievements of 2018. The tourism industry will meet the target of 18 million foreign tourists and take substantive steps to turn tourism into a ‘spearhead industry’ by 2020 as per the Politburo’s Resolution 08-NQ/TW. The national strategy to develop cultural industries by 2020, with orientations toward 2030 is also an opportunity to realise the ambition to promote Vietnamese people’s strengths and culture. Economic development based on culture and innovation is the most sustainable path for Vietnam to move forward.